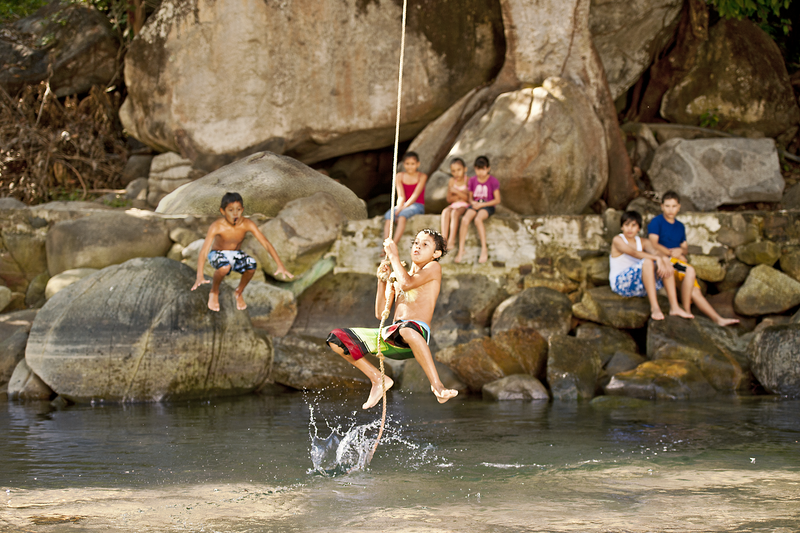 Puerto Vallarta has unusual swimming holes popular with families. Adults and kids enjoy strolling the Malecon to see the many public artworks. 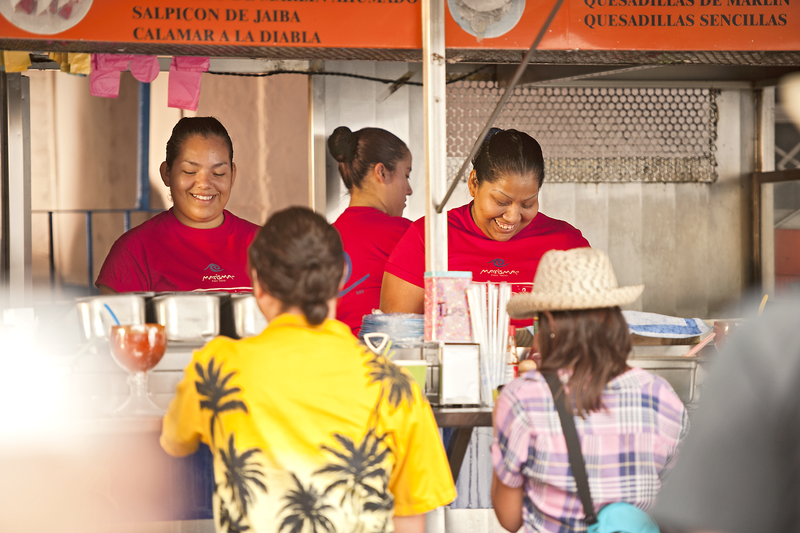 In addition to international restaurants and gourmet Mexican cafes, there's great street food. Las Caletas is one of Puerto Vallarta's most beautiful places to swim and kayak. One of Mexico’s favorite family vacation destinations, Puerto Vallarta, provides hands-on activities with kids that are sure to create lifelong connections whether you’re a single parent, grandparent, doting uncle, or what sociologists like to call a PANK (professional aunt no kids). On September 16, join us for a #discoverPV #gno Twitter Party and enter to win a three-night family vacation at the Costa Sur Resort & Spa. Puerto Vallarta offers single parent families, especially, a wide array of activities and family-friendly accommodations that focus on the specific needs of a single parent. You’ll be able to enjoy some quality time with the kids as well as enjoying some down time alone. Anyone looking to spend a memorable vacation with kids will find superior alternatives in one of Mexico’s most traditional seaside destinations on the Pacific Ocean. Located in the state of Jalisco, Puerto Vallarta encompasses all of Banderas Bay on the Pacific coast of Mexico and features 40 miles of coastline. Rich in culture and steeped in tradition, it conserves all of the charm and character of a small Mexican village while being a sophisticated international resort. Vacations are a great opportunity for bonding time with the kids; Puerto Vallarta’s bohemian charm can prove to be one of the most unique and long lasting connections for the entire family. Families can take a walk along the seaside Malécon and create a Huichol craft with Native Indian artisans at one of the many shops. They can shop for and share a new postcard in anticipation of the many vacation spots they will visit. Children can write about their experiences, collect photos, and treasure valuable moments. Take pictures with the public collection of sculptures or enjoy the free outdoor entertainment that includes concerts, theater, mimes, and the flying dancers of Papantla. On Thursdays and Sunday nights, singles can dance with their kids at the main town square, right across from the Malécon. When the Puerto Vallarta Municipal Band performs live, visitors like to join the local couples and families who congregate for an open air, old-fashioned town hall dance. Adults can be adventurous, too, and make the trip an educational experience for the kids by going green. Many local outfitters have organized safe, supervised, eco-friendly activities that take place in the local jungle and by the pristine sea. Small children love Las Caletas. Take a day trip to this secluded beach hideaway that’s only accessible by sea. (Small ferry boats leave from the harbor regularly.) 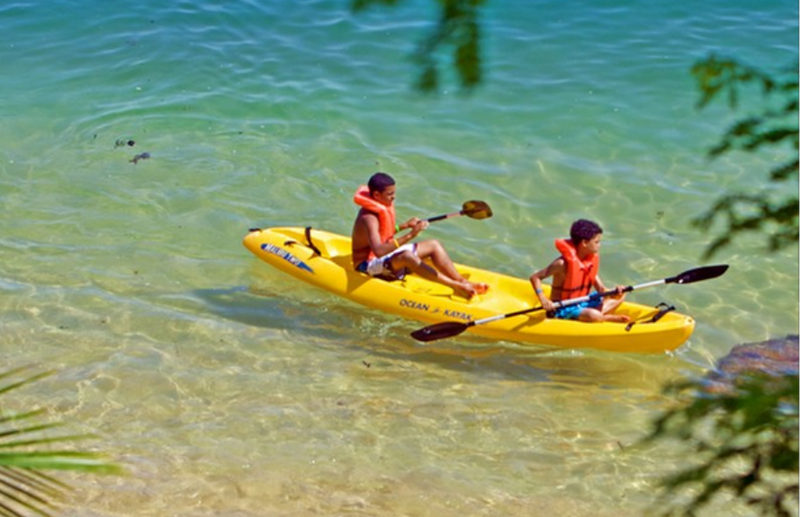 Bond with the children and snorkel with sea lions, scuba dive or kayaking and explore the area on a guided nature walk. Traveling with the kids does not mean an adult can’t take some time for himself/herself. For single parents wanting to enjoy some down time on their vacation, numerous Puerto Vallarta hotels and resorts offer babysitting service and supervised children’s clubs complete with a wide range of activities. Parents can enjoy some time alone, playing golf, or at a hotel spa. Of course, it’s also a beautiful place to relax reading a book by the sea, sipping one of the many local cocktails (served in a pineapple or coconut shell). Or, schedule a cooking class at El Arrayan, a restaurant specializing in regional Mexican cuisine, to learn how to make some mole, ceviche or any of your favorite Mexican dishes. End your day with salsa classes or a cocktail at one of the many bars and lounges in Zona Romantica. Adults with or without kids will never appreciate how much there is to see and do in Puerto Vallarta, until they plan their own Puerto Vallarta beach vacation. This post is sponsored by Puerto Vallarta Tourism; we’ll be participating in a fun #GNO Twitter Party September 16, 2014 at 9pm EDT to talk more about this destination. Stay tuned!